Starting a new thread on basic trainer design for hang gliding learning. My intent is to build a glider so easy to ground handle with good roll control response in flight and good pitch damping + slow flight and landing, that we almost return to the days of the rogallo but without the bad characteristics of that flat flex wing design. Many people taught themselves or took lessons with gliders that were easy to ground handle and fly but lacked the good parts of the fixed camber airfoil (battens) and reflex of today's flex wings. This is strictly a "training hill" or "dune grooming soaring" glider. Shooting for a all up weight of less than 40 lbs using 1-1/2" cable braced tubing (similar to the WW SST) and thin light sail material. I'm assuming a low sink rate with a glide ratio somewhere between that of the old standard rogallo and today's single surface flex wings. Maybe the L/D will be in the neighborhood of a large paraglider. My first thoughts on this design is shown below. Please carefully read all of the text on the drawing before commenting. My first ponderings about a basic HG trainer. Last edited by Frank Colver on Sun May 13, 2018 2:30 pm, edited 1 time in total. Shortening the wing span should make roll control much easier when standing on launch. In my experience, that's what people struggle the most with at Dockweiler. [quote="Bob Kuczewski. Shortening the wing span should make roll control much easier when standing on launch. Yeah, that's the general idea, Bob. That's why the old standard rogallo was so much easier to ground handle. But without a permanent defined airfoil it was harder to launch. You had to be more careful of angle of attack as you started running. Higher aspect ratio & span is needed when we want a good L/D but not necessary for a low sink rate. That's where large area and high camber airfoil can get you. I plan to copy the Condor 330 airfoil in the front. Note the return to the WW "swallow tail" for reflexing the center batton of the sail and a generous amount of movement of the keel pocket in roll control. If I decide to go further along these lines I'll build a 1/5 scale free flight model to test, like I did with my Skysail in '71. If I were to build the full scale HG I could probably purchase a lot of the hardware from Wills Wing. Like for the three corners that are 120 deg I could use WW Falcon or Alpha nose plates, etc. From WW archives I have the "wingpost" LE cable bracing drawings which I could duplicate if they turn out to be what I need there. As it is presently shown, I would need to brace the LE's on the inside, under the sail instead of out in front because the cross spar goes all the way out to the LE tip corner. The pull on the sail would be trying to bend the LE inward in the center instead of tip flexing. A lot of mechanical and structural design yet to be done before a simple outline becomes a buildable (& foldable) glider. Regardless of design, after a few flights students will want to fly the one that goes the farthest. Right Rick that's the idea! Get them used to an easy handling glider that flies like a rigid PG and then move them on to one of the utility gliders for mountain flying. Are you saying you are not for this approach to learning? The status quo is good enough? But for beach dune soaring the basic trainer is the best. Being able to work in closer to the dune and fly slow is a big advantage there. So, even advanced pilots would still be using the trainer for that type of flying, like Dockweiler soaring. Frank, while I do believe the status quo as defined by a novice learning to fly on any old, bagged out single surface wing IS sufficient and proven over generations, I am open to new ideas. But I'm afraid the idea of winning soaring parachutists over to hang gliding by designing even more responsive trainers doesn't explain why we once had tens of thousands of hang glider pilots without them. Hang gliding is inherently harder to learn than paragliding. Greater effort yeilds a greater reward. I don't care if pilots struggle with wide wings at take off. That's a skill you learn. Struggling at takeoff is how you learn it. Greater effort and learning produce better pilots. The problem with dwindling hang glider pilot numbers has to do with the absence of a real national hang gliding association. Too high a bar for training, absence of honesty and a shameful level of advocacy. The potpouri we have now doesn't work for hang gliding. Until that changes, I doubt any innovations will matter much. But I encourage you to prove me wrong. Rick, Jim's suprone harness and flybar will prove you wrong. 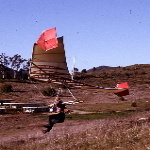 Rick Masters wrote: The problem with dwindling hang glider pilot numbers has to do with the absence of a real national hang gliding association. I think everything we can do can help some. Those who want to design new gliders can help. Those who want to design new harnesses can help. Those who want to build new associations can help. Without the benefit of omniscience it's hard to know which little part will help the most. But every little part helps some. The key is to find a part - any part at all - that inspires you and do it. Whether it's publishing great historical accounts (thanks Rick) or designing new gliders (thanks Frank) or holding meets (thanks Sam) or finding new training hills (thanks Scott) or posting to hanggliding.org (thanks Mike) or attending Supervisors meetings (thanks Joe) or quitting USHPA (thanks Bill) or posting regular club events (thanks Robin) or testifying in court (thanks Ernie), or doing any of the hundreds of other things our members have done ... they're all a part of saving the sport that we all love. The key is to go out there and DO SOMETHING!!! Jim's suprone harness and flybar will prove you wrong. He showed it to me the other day. and I like what Jim has done to ensure roll authority on par or perhaps greater than prone. That should be a big deal. It may attract parachutists and older folks to hang gliding. As for performance-oriented pilots, I doubt they'll show much interest. Two horizontal bars present too much drag. Hold a base tube out a car window at 50 mph to see what I'm talking about. The fact that only one horizontal control frame member is needed is key to a new suprone hang glider design. The trick would be to make a control bar shaped like a capital "A". The horizontal section would be bowed forward for comfort and a cable runing through it for safety. The side wire attachment points could be engineered to be higher on the frame, closer to the horizontal member. Overall, of course, this produces more stress on the horizontal bar. The flybar and the lower legs to the side wire attachment points would probably have to be stainless steel to withstand tension at 4 gs from the side wires without yielding or work-hardening. If you didn't want to go to that much trouble, then simply replacing the base tube with a cable would help. It's not that I don't like the new harness. I do. What bothers me is that I think the new harness requires a new design of control frame to be complete. That lower crossmember is completely unnecessary. If it was gone, the drag presented by the suprone harness and the control frame would approach that of a prone pilot on a conventional frame. It would do away with the interference of the lower bar in launching and landing. It would also look extremely cool. I agree but what Jim is starting out with I think is the right approach. Start first with a system that existing HG pilots can go with on their current gliders and then evolve into new glider designs specifically for suprone. Meanwhile, I'm going back to seated with an option to use a Flybar or legs below the bar as in the days of yesteryear. Remember, not everyone wants to fly cross country. That said, this thread should return to discussions about basic trainer design ideas. I make the case that more people will take up hang gliding and become enthusiasts and then advance into more sophisticated better performance hang gliders if their first flights off a training hill are easy and fun without a lot of struggle. It took me a lot of time to learn to fly because I was learning on a high performance glider, my Skysail. If I hadn't designed and built it myself I might have given up. Once the Skysail got beat up to the point I was concerned about its airworthiness I bought an Eipper Flexi Floater (standard rogallo) and discovered why so many people had taught themselves so quickly. It was a "piece of cake". I'm for returning to that easy beginning to the pilot learning curve for hang gliding but with a better design than the "standard" Rogallo. Get people "hooked" first, then advance them.